What most people know is that Hanoi Rocks toured the Far East, released the album Back To Mystery City and prepared for their big-label (CBS/Columbia) debut Two Steps From The Move in 1983. However, Hanoi Rocks also recorded plenty of material that autumn. Some of it has actually never seen the light of day in its original form. Some songs were remade and remodelled, some demo version still remain shelved. 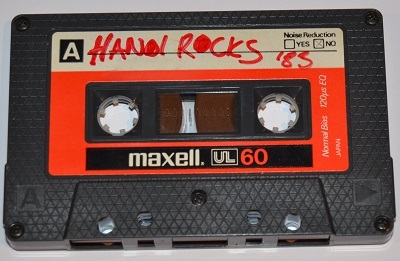 The tale of the late 1983 Hanoi Rocks recordings is an interesting part of the Hanoi Rocks saga as the sessions yielded almost a "lost album" of sorts. It is not 100 per cent sure where the demoing/pre-production sessions took place. A good guess is London´s Greenhouse Studios, where the band spent a lot of time in 1983 and 1984. The sound is very identical, which suggests the songs were recorded during the same session(s). Sound is quite lightweight with very few overdubs. The songs still sound rehearsed and well-recorded. What follows is a short track-by-track analysis of the ten songs recorded in the fall of 1983. This song was written especially for Japanese artist Yasuaki Honda, who released his version in 1983 (together with another Andy McCoy composition, Hey Girl). Hanoi Rocks (minus Nasty, it has been reported) provided backing for Honda. Hanoi Rocks´ own version is very similar to Honda´s take, actually the backing track might be the same. 21 years later the song was revisited by the current Hanoi Rocks lineup with some rewritten lyrics, and released as a single in 2004. The original Hanoi Rocks demo remains unreleased to this day. Bluesy feeling track, opens with a drum roll and harmonica. Poppy verses, during which guitar riff bears a resemblance to Bruce Springsteen´s Fire. Bursts into a pretty typical (predictable) McCoy chorus ("Bad Love, gotta make it better") latter part of which is quite similar to Cutting Corners and bridge section. Demo version of the song that was re-recorded with Bob Ezrin in Toronto during Two Steps From The Move sessions, but released only as a b-side to Underwater World. Demo has the same arrangement, but playing is somewhat sloppier compared to the Ezrin-version. Also the lyrics differ, being a bit raunchier originally. ("It´s 1984 and we´re knocking on heaven´s door" etc.) It is probable that Ezrin took part in writing new lyrics, since he has a co-writing credit on the final version. Mid-tempo song with poppy, singalong chorus. Reminds tracks like Teenangels Outsiders or Don´t Follow Me. Has an interesting instrumental bridge with an eerie feeling created by two guitars. The so-called "harmonica version" of Hanoi´s fourth album´s planned title track. This version has been released on many compilations, first on the excellent Tracks From A Broken Dream and later on Decadent Dangerous Delicious. Michael Monroe plays fervent harmonica on this take, hence the name. Otherwise, the arrangement is quite similar. Like Shakes, this song was finalized with Bob Ezrin during the album sessions, but got dropped in favour of Up Around The Bend. Original, longer slower and heavier version of a song later re-recorded and re-arranged during Two Steps From The Move sessions. The original version has a slightly differently phrased guitar riff and different lyrics, but the biggest difference is in the middle section, which is completely different from the finished version. That fanfare-like middle part has all Ezrin´s trademarks (compare it with Bouleverd Of Broken Dream´s middle and Alice Cooper´s Elected´s middle and you get my drift), while the demo´s middle is quite dull with sax and guitar playing a quite predictable melody line in unison. Again, Ezrin´s influence is quite clear, since the finished version is very much better than this first attempt of the song. A short and simple throwaway song, which has the feel of an unfinished composition, mainly for the ending, which sounds rushed and pointless. First released on Briard´s Miss World album in 1983 (the recording took place in Helsinki some time late 1983 and featured Andy & Nasty) as Me And My Habbit. This Hanoi Rocks demo version was first released on the bonus 4-track 12" disc that came with the original Finnish Best Of Hanoi Rocks double album in 1985. Later it surfaced on the Tracks From A Broken Dream compilation. Another quite familiar track. The song itself doesn´t quite get off the ground, but provided a great riff for Boiler, which was composed by the whole group during Two Steps From The Move sessions in 1984. This version has been released on the Tracks From A Broken Dream compilation. This song found its way to Cherry Bombz´ live repertoire in 1986 as Pin Up Boy. Mid-tempo pop-rock song. The verses and chorus also are very similar to Ice Cream Summer, as is the overall feel of the track. Basically the same ideas re-used. The real surprise of this collection. First run-through of the song which became a classic as Million Miles Away. A slower, bluesy approach makes this very different than the final versions´ straight love-balladry. The section "You´re so ordinary yet so very fine" is there, but played more slowly. Piano carries the whole song as in the finished version. All the final parts are presents, but it seems the whole idea of the song hasn´t gotten clear yet...The tape ends abruptly during the chorus which in the final version precedes the fast section leading to the "please don´t be thinking of me" part, leaving the ending out so there isn´t a whole version to be figured out. ...AND WHERE CAN I FIND THESE SONGS? As mentioned, quite a few have been already released on various compilations. But also a 40-minute cassette exists, with all the songs in the running order presented here. Don´t ask me where it can be found, I really can´t tell. But let´s hope the unreleased songs see the light of day sometime. They aren´t essential Hanoi Rocks gems, but surely interesting items for any Hanoi Rocks collector.